Paper presented at Federation Of Zoological Gardens Of Great Britain And Ireland, Fifth Annual Plant Group Conference, Zoological Society Of Ireland, September 5th - 7th 2001 © Karen Foley 2019. The Gulf Stream and the North Atlantic drift, originating in the Gulf of Mexico, have a major influence on the climate in Ireland and consequently on our exotic flora. This warm current and the predominantly south westerly winds that blow over it give Ireland an essentially maritime climate of mild winters, cool summers and all-the-year round rainfall. Ireland lies nearer to the North Pole than to the Equator and is further north than Newfoundland . If it were not for the warm westerly winds and the Gulf Stream , Ireland would be icebound for part of the winter, somewhat similar to the Labrador coast of North America . In contrast the mean temperature of the coldest month (January) ranges from 7° C in the south to 4° C in the north. The west, south and much of the east coastal areas of Ireland are classified as Climatic Zone 9, the same as the Mediterranean coast of France . 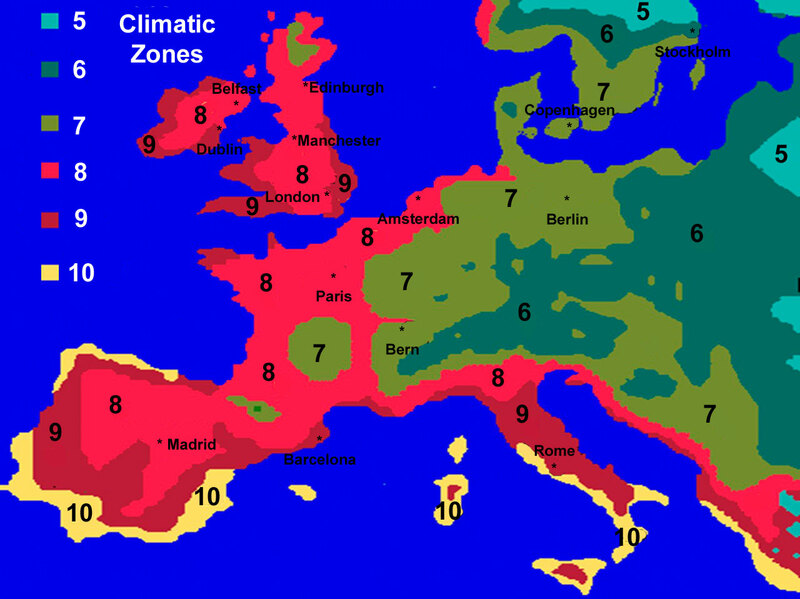 The remainder of Ireland is Climatic Zone 8. Summer temperatures are comparatively low. The mean daily temperature for the warmest month (July) is 14.5° C - 16° C for most lowland areas. Prolonged summer heat and extreme winter cold are uncommon. In the south west of the country there is only 8° C difference in temperature between the means of the coldest and warmest months and only 10 to 11° C difference in most of the rest of the country. Rainfall varies from 650 to 1000 mm in the drier east and midlands and from over 1,000 to over 2,000 in the south and west. Rain falls in every month of the year, although there is a tendency for the period March to June to be the driest and December the wettest. Each of the 12 months has been the wettest or the driest in some year. While the mild climate and ample rainfall encourages the growth of a wide range of plant species, Ireland has a very restricted natural flora due to the early breakdown of the land connection with Europe . Consequently Ireland has only two thirds of the 1349 native flowering plants found in Britain . Only three evergreen tree genera (Arbutus, Ilex and Taxus) and 13 deciduous genera (Alnus, Betula, Corylus, Crataegus, Fraxinus, Malus, Populus, Prunus, Quercus, Rhamnus, Salix, Sorbus and Ulmus) are native. However the climate encourages the growth of a richer and more diverse range of exotic plants than any other country of similar latitude and species from all continents are found in Irish gardens. Of the most commonly used 1,400 tree and shrub species about 30% were introduced from Asia especially from Japan and the Himalayas, around 21% from North America, about 20% from Europe and the remaining 23% are mainly introductions from the southern hemisphere (Hannan, 1970). Many Zone 9 plants have been planted in a garden at Earlscliffe, Baily, Co Dublin between 1969 and 2001 and the remainder of this contribution deals with a few of these plants. A more extensive list of the plants grown is given in the following paper. As in most mild gardens in Ireland some of the Zone 9 plants grown here come from the northern hemisphere, notably the Canary Islands, the majority come from South America, South Africa and Australasia. Earlscliffe is a coastal garden on the Howth peninsula just north of Dublin city. It has a good microclimate being sheltered on the north by the 180 metres high Hill of Howth and extending on the south side down to high watermark. Air frosts occur regularly generally between early December and mid April. The absolute lowest winter minimum is usually about - 4º C but more severe frosts occur from time to time. Temperatures of -7.5 º C were recorded in December 1995 and -7.0 º C in December 2000. Except for the 2000/01 winter, freezing days when the temperature does not rise above 0 º C, are rare. Because of the proximity of the sea, summer temperatures are moderate, seldom exceeding 23º C. The absolute maximum recorded since 1969 was 27.5º C in August 1995 during a prolonged warm spell. Average annual rainfall is only 650 mm but this is spread fairly evenly throughout the year and periods of drought are rare. The soil at Earlscliffe is derived from Cambrian shale and quartzite and contains approximately 25% clay and 4.5% organic matter in the top 8 cm. It is mostly acid to neutral (pH 5.0 - 6.5) in contrast to the alkalinity of the limestone derived soil of most of County Dublin . When a exotic plant spreads by means of self sown seedlings it indicates that local conditions are suitable. 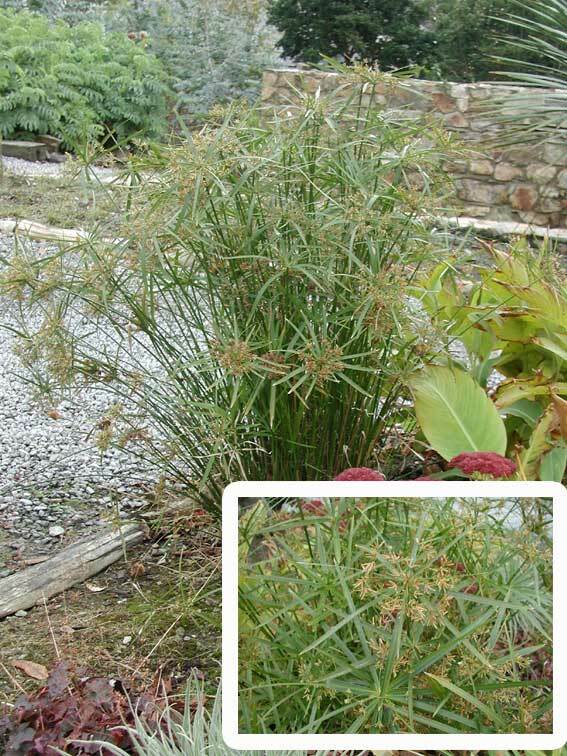 As in other mild areas in Ireland , many Climatic Zone 9 plants, such as Luma apiculata, Solanum laciniatum and Cordyline australis, propagate themselves freely. Hundreds of seedlings of these species occur each year, often in areas well away from the parent plants. 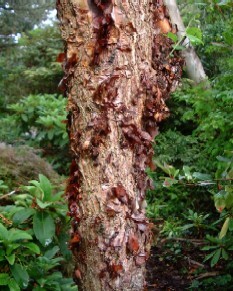 As a millennium project, advantage has been taken of the fecundity of Luma apiculata to establish a small woodland consisting of 100 plants of this species, one for each decade of the 20th century. The plants for the new woodland were all self sown seedlings dug up from various parts of the garden, the last tree was planted as dusk was falling on New Year's Eve 1999. Luma apiculata with its beautiful cinnamon-coloured bark, grows as happily on the Howth peninsula as it does in its native Chile and Argentina This tree becomes more beautiful as it ages and the new woodland should be an attractive feature in about 25 years' time. The kangaroo apple (Solanum laciniatum) with violet blue flowers up to 5 cm wide followed by orange yellow egg-shaped fruits, can grow to a height of over 3 metres. All plants were killed by - 7º C in December 2000 but large numbers of seedling appeared during the following season and made rapid growth. The most notable self seeder at Earlscliffe is the Giant Borage, Echium pininana. Although this is an endangered species in its native Canary Islands , it self seeds freely in many coastal areas of Ireland . Plants can grow from over 1 m to a height of 6 m between February and early June. The plant flowers in its second or third year and, being monocarpic, dies after flowering. 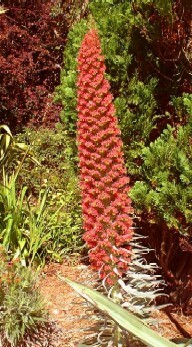 E. pininana is cross pollinated and produces seeds prolifically (in excess of 200,000/plant), which germinate readily and dense carpets of Echium seedlings are commonplace. Plants developing from these seedlings survive most winters but in hard winters many are killed by cold. On two occasions (1978/79 and 1986/87) during the last 24 years all plants were killed by temperatures less than - 6º C in January. Following such severe winters seedlings develop from the seed bank in the soil. It seems possible that natural selection is producing a more cold hardy strain of E. pininana, as in two recent cold winters (1995/6 and 2000/01) when temperatures fell to -7 º C, many seedling survived. 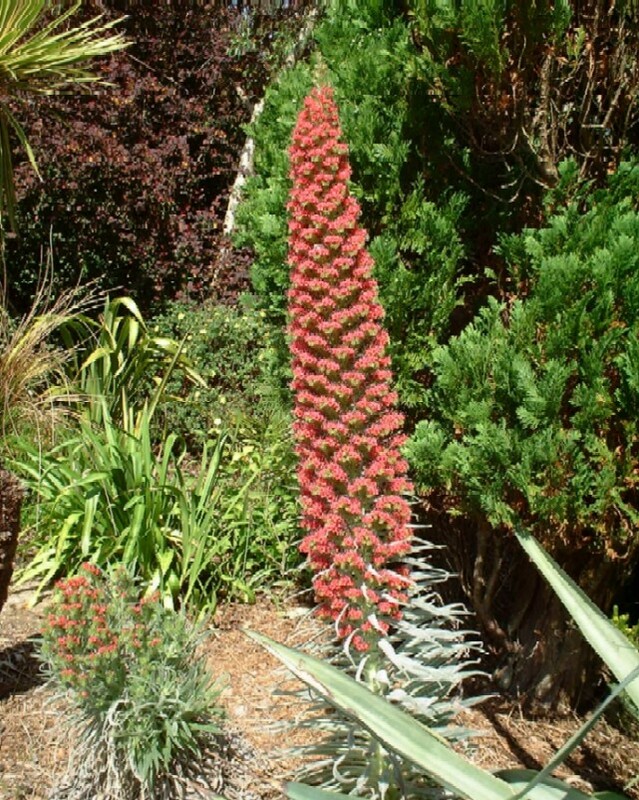 Unlike E. pininana, the more beautiful red flowered Echium wildpretii is not on the endangered list in the Canary Island EN-GB">, although in Ireland EN-GB">it is much more tender. Many plants are killed in a cold winter and all may succumb in an exceptionally cold season. In the 2000/01 winter about 20 plants of potential flowering size were killed and only one survived. Seed is now being collected from this plant, for sowing in spring 2002, as it may be inherently hardier than the rest of the population. Although grown since 1990, Echium wildpretii failed to self seed until spring 2001, when scores of seedlings appeared in areas where the plant had been grown the previous year. This suggests that natural selection is producing a more cold hardy strain of this species also. Hybrids between E wildpretii and E. pininana occur occasionally. These are also striking plants being intermediate in height, colour and type of inflorescence between the parents. The hybrids appear to be hardier than either of the parents as leaf wilting during periods of low temperature is less severe than with either of the parents and none of the hybrids has been killed by winter frost. Many other climatic zone 9 plants self propagate at Earlscliffe, although in a less profligate manner. These include Dicksonia antarctica , Lomatia ferruginea, Callistemon citrinus, Erica arborea, Phormium tenax and Dodonaea viscosa 'Purpurea'. Dicksonia antarctica EN-GB">does not self propagate in soil but in peat sods stored in open polythene bags stored behind a north wall. Several Eucalyptus species also self seed including E. gunnii, E. globulus, E. cordata, E. urnigera and E. pulverulenta. These are only a few of approximately 130 species that have been planted at Earlscliffe to test for hardiness and suitability for cut foliage since 1969. About 60 species mainly native of Tasmania , Victoria and/or New South Wales have survived. No species endemic in Western Australia , South Australia or Queensland survived for more than a few years, although E. pauciflora and viminalis occur in South Australia as well as Victoria and New South Wales . The beautiful leaf-scented E. citriodora from latitudes 20 to 25º in Queensland survived for a few years until it was killed by the severe 1995/96 winter. Growth of most of the surviving species was rapid compared with native trees. Some tree heights measured in October 1976 from seed sown in February of a previous year were:- after 4 seasons E. parvifolia 4 m; after 5 seasons E. maideni 8.4 m, E. cordata 9 m, E. pauciflora var Bothwell 7 m, E. dalrympleana 7 m; after 7 seasons E. goniocalyx 6.7 m, E. delegatensis 8 m, E. johnstoni 8 m, E. urnigera 8 m.
The red flowering gum Corymbia ficifolia (formerly Eucalyptus ficifolia) is a most striking tree carrying masses of brilliant red flowers. In addition the leaves are attractive being like a Ficus but with red mid-rib and margins. It is severely damaged when the temperature falls below - 4º C. At Earlscliffe this eucalypt survived the 1974/75 and 1975/76 winters well and flowered between September and November 1976. The tree failed to set seed, was severely injured the following winter and died in spring 1977. In an attempt to produce a eucalypt with red flowers and which would survive the Irish winter, a six week visit was made to Western and Southern Australia in January/February 1996 to collect seed of Corymbia ficifolia. Although recognising that the chance of success was not high, it seemed worthwhile to collect seed of C. ficifolia where it occurs naturally and also from other less favourable areas. Seedlings could then be raised and planted out in Ireland and, although most would inevitably be killed by winter cold, one or two seedlings might prove hardy. These could then be propagated by tissue culture. Unlike many eucalyptus species, C. ficifolia has a very restricted natural range and occurs only in two small areas - inland about 30 miles north east from the town of Walpole near Mount Frankland in south west Australia and right on the coast about nine miles east of Walpole. The area near Mount Frankland is less than 300 metres above sea level so that there might not be a great difference in the harshness of the climate between the two areas. Seed was collected from these areas of natural occurrence and also from trees that had been planted in other colder parts of Western Australia . The seed, sown at Earlscliffe in cold glass in April 1996, germinated readily. Some seedlings were planted out in autumn and the majority in spring 1997. Subsequent winters were mild and all seedlings grew well without injury until December 2000 when many were about 3 metres tall. The severe frost from December 26th to 30th killed back all seedlings although the damage did not show until late January. In May 2001 about 5% of seedlings resprouted from the base and an attempt is being made by staff at University College , Dublin to propagate these few survivors by tissue culture. In addition to this attempt to allow the climate to select out a hardier strain of C. ficifolia, a small breeding programme is also underway with the same purpose. C.ficifolia will not hybridise with any of the hardy Eucalypts that survive in Ireland as they belong to different sub-genera. However, one of the red flowered Eucalyptus species, E. caesia belongs to the same subgenus as E. pulverulenta and E. gunnii and these species will hybridise. About 100 flowers of E. pulverulenta were pollinated with pollen of E. caesia flown in from Western Australia in May 1996. Tests for viability on this pollen showed that it was lacking in vigour on arrival in Ireland . Only five capsules set seed following pollination and the subsequent seedlings were weak and did not survive the first season. A tree of E. caesia has been planted in a greenhouse at the National Botanic Gardens and it is planned to use pollen from this tree when it flowers in further crossings. In addition to the widely grown Trachycarpus fortunei and Chamaerops humilis, several other members of the family Palmae grow at Earlscliffe. The rarest of the palms is the Chonta (Juania australis) from the Juan Fernandez islands (Robinson Crusoe's island). Planted in September 1995, Juania has grown well and has shown no signs of cold or wind damage throughout this period and is pest and disease free. It is now about 2.5 metres tall with leaves up to 2.2 metres in length. Juania australis is cited in the literature as 'the ungrowable palm' (Morici, 2001), 'difficult to grow' (Endt, 1996) or 'most efforts to bring it into cultivation have failed (Gunter and Mahalik, 1990). Morici (2000) states that the cultural needs of this palm are quite peculiar and that only one mature specimen survives away from its native home (in Santiago de Chile). With this reputation, the ease with which Juania australis is growing at Earlcliffe is surprising. During the 6 years since planting, it has received no attention apart from an occasional directed spray of glyphosate to remove any small weeds developing at its base. Jubaea chilensis (the Chilean Wine palm) is reputed to be a slow growing, long lived tree with a life span of 700 to 1,000 years. Planted around 1971, it is still only 1.4 metres in height in August 2001 although the circumference at ground level is over 70 cm. The tree is growing at approximately 7 cm/year which is less than a tree in Torquay (South Devon) which grew to a height of 7 metres tall in approximately 72 years (about 9.6 cm/year) (Taylor, 1990). The tree at Earlscliffe has survived all winters since the early 1970s without obvious signs of injury and continues to grow slowly. Because of its apparent hardiness, it should make an interesting contribution to the palm collection at Earlscliffe in the 22nd century! Doryophora sassafras is an evergreen tree from New South Wales in the family Monimiaceae. This tree is interesting, not so much for its aromatic foliage or other attributes but for the fact that it grows in association with Wollemia nobilis (the Wollemi pine) in the remote canyon where this 'fossil' tree was discovered east of Sydney in 1994. D. sassafras was planted at Earlscliffe 1981 and is now 5 metres, tall. As it has never been damaged by winter frost, this suggests that the Wollemi pine may also survive in mild parts of Ireland. Despite its location at 53.3º N latitude, Earlscliffe has a remarkably wide range of Climatic Zone 9 plants (and some that are erroneously classified in the New RHS Dictionary of Gardening as Zone 10). These include Cyperus alternifolius, Ochagavea carnea, Araucaria bidwillii and Itoa orientalis. The favourable microclimate is the major factor contributing to the survival of these plants. However, it seems likely that the method of soil management contributes to some degree to tolerance of low temperature injury. Since 1969 weeds have been controlled almost entirely by herbicides, mainly glyphosate, paraquat and simazine* and the soil is not disturbed by cultivation after planting. No fertilisers are used on trees and shrubs and plants are not given artificial protection from low temperatures during the winter. 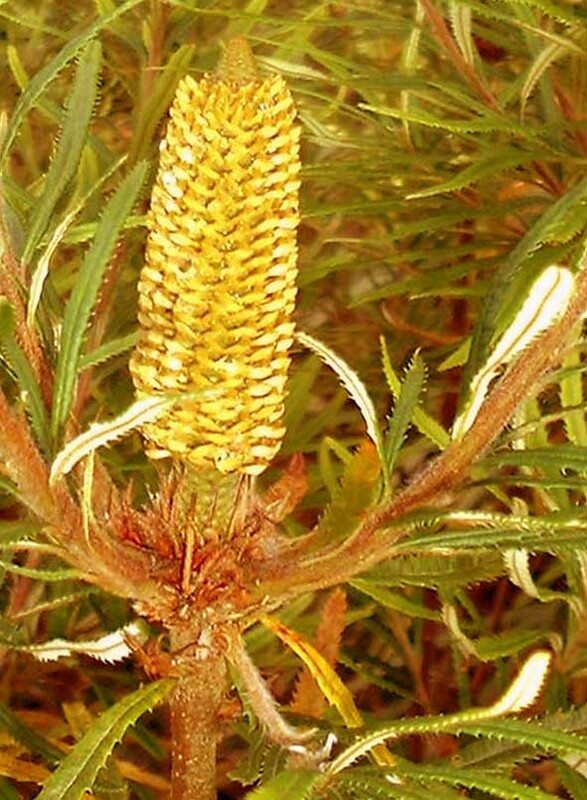 Simazine is applied as an overall spray on all tree and shrub plantings except where Protea and Banksia are grown. These genera are susceptible to low doses of simazine but most woody plants are tolerant. The use of a herbicide programme without cultivation encourages plants to develop an extensive surface root system. Numerous root excavations suggest that many plants will develop preferentially roots close to the soil surface, if moisture and temperature conditions and absence of mechanical damage permit them to do so. This occurs because the surface soil tends to be richer in oxygen and nutrients than deeper layers. Many experiments between the 1950s and 1970s show that fruit crops grow more vigorously and crop more heavily on herbicide-treated plots than on those cultivated, mulched or grassed down (Robinson 1963, 1978). Depressed yields with the latter treatments were attributed to repeated root damage on cultivated plots, to lower temperatures where mulches were used and to competition for moisture and nutrients on grassed plots. It seems likely that the response of ornamental trees and shrubs would be similar to that of woody fruit crops. It is widely recognised that well grown plants are better able to cope with cold than plants in a weakened condition. A correlation between the development of frost hardiness and an increase in sugar content has been demonstrated for a large number but not for all plants (Kramer and Kozlowski, 1979). The exact role of sugar is still debated but it has been suggested that high sugar decreases the freezing point by accumulating in the vacuoles and decreasing the amount of ice formed (Levitt, 1972). Because of the link between plant well-being and tolerance of low temperature, many cultural factors are relevant, including nutrition and method of soil management. Excavation of the previously undisturbed root system of a South African heath Erica canaliculata showed that most of the root system was in the top 5 cm of soil. Hoeing around this plants or hand pulling established weeds of annual meadow grass (Poa annua) and other fibrous-rooted weeds would damage the root system of the Erica and result in a less cold tolerant plant. Herbicides are not merely an alternative method of weed control to cultivation. Used judiciously they are also, indirectly, growth promoting substances and contribute to the successful cultivation of tender plants in marginally suitable areas. Endt, D. (1991). The native palms of Chile : A rare opportunity to visit the Private Hacienda, Las Palmas cocalan. Principes , 35 (1), 19 - 21. Gunter, B. and Mahalik, P. (1990). Juania australis in Habitat. Principes , 34 (2), 79 -81. Hannan, A. (1979). Personal communication. Morici, C. (2000). Paschalococos and the disappearing palms. Chamaerops 40, 5 - 7. Robinson, D. W. and O'Kennedy, N. D. (1978). The effect of overall herbicide systems of soil management on growth and yield of apple trees. Scientia Horticulturae, 9, 227 -236.